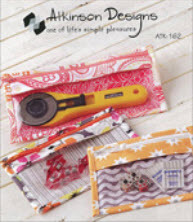 I just made these great little zippered pouches using a pattern from Atkinson Designs called “Bridget’s Bagettes.” They were very fun and super easy to make. I had a few fat quarters that I had put in the donation tub but decided to pull them out and use them after I saw this pattern. I love the vinyl pockets so I can see what is in each bag. 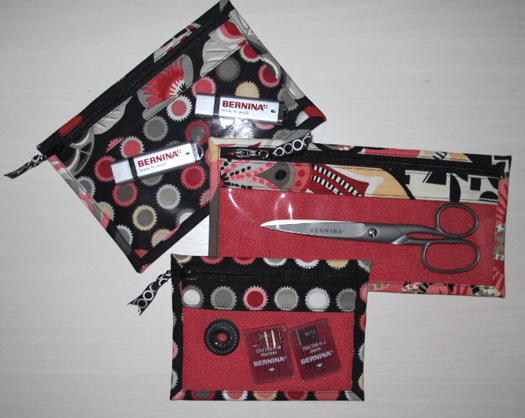 BERNINA’s non-stick feet really make the sewing on vinyl very easy. After making a few of these I realized that I can make them any size I want so plan on doing several project bags. They will make great Christmas gifts for the Grandkids with specific little gifts inside. I can even coordinate the fabric with the gift. 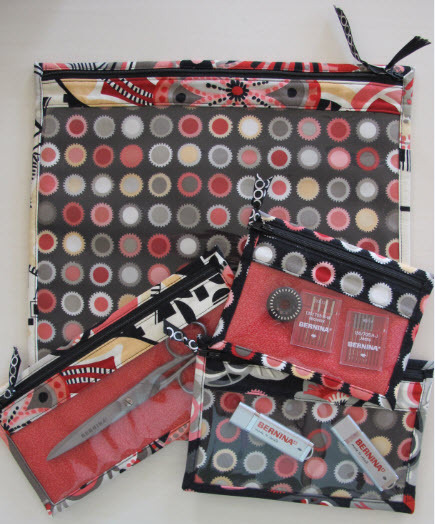 I could go on and on—I love these zippered pouches! These little pouches are great made with window screen mesh too. Just pick up a small roll of nylon window screen mesh at Lowes or Home Depot and use the mesh in place of the vinyl, or the fabric. Be sure and include the edges of the mesh in some fabric binding.